Malone’s phone-a-thon offers students an opportunity to speak with alumni and raise money for the Malone fund. In this paid position, student workers contact graduates of at least two years in order to update records, listen to personal stories and ask for donations to the Malone fund. The Malone fund bridges the gap between tuition revenue and endowments. According to Calhoun, the overall purpose of the phone-a-thon is to connect with alumni and learn more about [alumni] Malone experiences. This is also a great networking opportunity for students as they can learn about internships and job postings and get advice from the alumni about life after college. This is not just about the Malone fund. “My favorite part about the phone-a-thon is working with the current Malone students and listening to them connect with Malone alumni. It’s more than just calling and asking for donations. It is building a relationship with the alumni,” said Calhoun. There will be a call center with 12 stations set up in the Johnson Center. All of the calls are made there between 6 p.m. and 9 p.m. Callers are to work Monday through Thursday depending on schedules and classes. Calhoun is looking for people who enjoy sharing their experiences and talking to alumni, as well as listening to alumni talk about their experiences and give advice for the future. “Our goal is to raise a million dollars this year for the Malone fund for the duration of the year,” said Calhoun. One student who has participated in Malone’s phone-a-thon is Tesha Hicks, senior psychology major. “The phone-a-thon raises money for scholarships, financial aid and for things like sports and buildings,” said Hicks. According to Hicks, she once talked to an alumnus in their 90’s. “If you’ve had a great experience at Malone you should consider [being a caller]. It’s really good experience on learning about other people. It is really nice to hear about other peoples’ time at Malone,” said Hicks. Barbara Jordan, junior creative writing major, has had similar experiences. “I really enjoy talking to the alumni and just getting to know them and their experience here at Malone and connecting with them in that way,” said Jordan. According to Jordan, alumni appreciate that Malone’s stance on faith and the student atmosphere have stayed consistent over time. 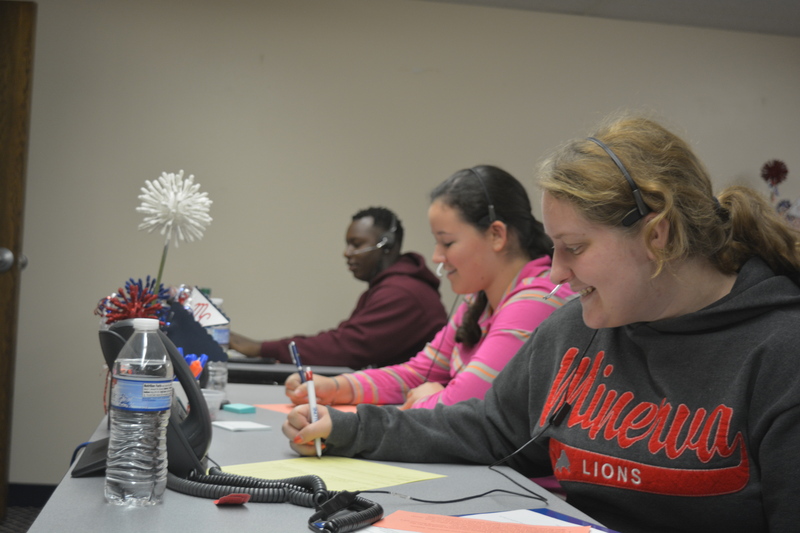 If interested in becoming a caller for the phone-a-thon, please contact Paula Calhoun at pcalhoun@malone.edu. The position is not a work study position, so all students are eligible to apply.